AN EXHIBITION OF SCIENCE, SKILL AND NERVE! By the Eminent Aerial Artists, PROFS HUNT AND PRICE. 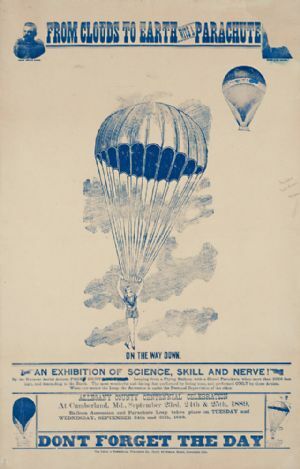 Leaping from a flying balloon, with a closed parachute, when more than 5,000 feet high, and descending to the Earth. The most wonderful and daring feat performed by living man, and performed ONLY by these artists. When one makes the Leap, the Ascension is under the Personal Supervision of the other. Prof Price's name is crossed out on the poster, and his picture torn off on the top right corner. What happened to Prof. Price is unknown. The poster was found badly damaged in the trunk. This image was made after it was restored by Maria Pukownik, of MP Fine Art and Paper Conservation, Ortanna, PA.